Lecture by Fr. Vazken Movsesian on the Armenian Genocide and post Genocide understanding of Armenian action. A new perspective on activism defined by a collective past. Recorded LIVE - at a gathering organized by the ASA of UCSB on April 25, 2013. Note: the recording microphone is stationary and the speaker walks around the room, causing different volume levels. Sermon on Red Sunday; on living out the lessons of Genocide as Armenian Christians. 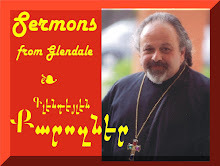 Sermon recorded LIVE at the St. Peter Armenian Church Youth Ministries' Center in Glendale, CA, on April 21, 2013. Sermon on New Sunday and the Anniversary of the Rwandan Genocide - April 7, 2013 - on the challenge of moving beyond commemoration and becoming a witness to the Resurrection, even in the case of Genocide. This sermon outlines the foundation of the work before the Armenian Church today. Intro - Guests Don & Lorna Miller, authors of Survivors. Armenian Sermon begins at 4:25 and English at 19:04. 10:00 - Armenian Sermon "I don't want you to be ignorant..."